…where it’s normal to love the Lord Jesus and to read the Bible. Every believer should have such a place; in fact, every believer NEEDS such a place. Here’s why. Many passages in the New Testament make it clear that believers in Christ Jesus should have a living that is distinct from that of unbelievers. The apostle Peter writes, “According to the Holy One who called you, you yourselves also be holy in all your manner of life” (1 Pet. 1:15). To be holy implies being set apart from everything to God. Being holy, or set apart, applies not only to our conduct outwardly but also to the inward source of our living—a living according to God’s holy nature. A few verses later, Peter mentions redemption, but not in the familiar way. When we as Christians hear the word redemption, we immediately think of Jesus dying for us as the Lamb of God to take away our sins (see John 1:29 or Ephesians 1:7). Of course, this is absolutely true and we praise God for this aspect of our redemption on a daily basis. But we may not realize that the New Testament applies the concept of redemption not only to the forgiveness of sins but also to our way of living. First Peter 1:18-19 says: “You were redeemed from your vain manner of life handed down from your fathers…with precious blood, as of a Lamb without blemish and without spot, the blood of Christ.” Instead of “vain manner of life,” some translations say, “useless way of life” or “empty lifestyle.” Peter doesn’t say here that we were redeemed from sin—he says that Jesus shed His precious blood to redeem us from our old living as unbelievers to a new way of living. If you’re a Christian in college and you agree that your faith should be expressed in your living, you’re in for a challenge. You don’t need to spend a long time on campus to find out that universities foster an environment quite contrary to the Christian life. Actually, the apostle Peter addresses such environments later on in his epistle: “For you have spent enough time in the past doing what pagans choose to do—living in debauchery, lust, drunkenness, orgies, carousing and detestable idolatry” (1 Pet. 4:3). In other words, we who have believed have lived as the unbelievers live for long enough. Second, several translations refer to the “reckless, wild living” as a “flood of debauchery.” We shouldn’t think that we as believers can step into the flood and not be swept away. Third, even more than being thought strange, we may be verbally abused or slandered. Facing this, how much the believers need a refuge, a safe haven, a community where it’s normal to love Jesus and to seek and pursue Him! We can and ought to testify of our faith in many ways, many venues, and to all kinds of people. But we need a place where we can be refreshed, encouraged, and emboldened to maintain our Christian walk. 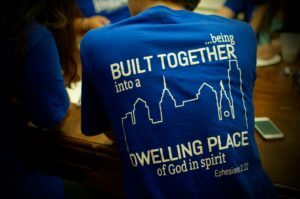 All of our Philly Christian Students activities—from our individual pursuit of the Lord through personal prayer and Bible reading to informal meet ups, Bible studies, and large corporate gatherings—serve the purpose of building up this kind of place. Come and talk freely about the verse that ministered to you in your quiet time this morning without having to defend the validity of the New Testament. Share a struggle that you’re having in one of your classes and you’ll find ready prayer partners. Find like-minded friends—friends that despite all their struggles, still have a heart to seek first the kingdom of God. Are you wondering if God is real and wanting to find out more? Philly Christian students is a place where sincere non-Christians can learn what being a Christian is all about without being pressured to convert. We are happy to answer your questions and hope that you can find the same deep peace and joy that we have found in Jesus.